March 2019 - Don Mills Builder, Inc. March 2019 - Don Mills Builder, Inc.
A hot trend for custom homes in 2019 is colorful kitchens. The sterile white subway tile look is definitely out according to the kitchen and home designers and popular design blogs. The popular new trend in kitchens is to customize your kitchen to your own personal taste with colorful cabinetry, unusual color countertops, or mosaic tile backsplashes in the kitchen. If you want to add color to the kitchen and don’t want to choose painted cabinets you should consider quartz countertops. Quartz countertops come in more than 80 colors and have unusual color patterns that will make your kitchen colorful but still elegant. Another hot trend for modern living in custom homes is the creation of multipurpose spaces in a home. Using an extra bedroom for an office, gym, or media room just doesn’t cut it for today’s homeowner. Talk to your builder about creating unique multipurpose spaces in your custom home that can do double duty as office space, play space for the kids or grandkids, a home theater space and more. Increasing the functionality of your home without sacrificing style is very much on trend. Have you embraced smart home technology? It’s one of the hottest trends in custom homes this year. Smart technology can save you time and money by increasing the efficiency of your home. If you are planning on staying in your home after retirement, installing smart appliances and technology now can also help you stay safe and healthy in your home for years to come. Talk to your custom home builder about smart appliances and other smart technology to see how making your custom home a smart home can make your life easier and save you money in the long run. 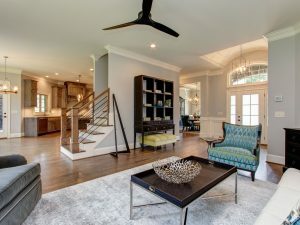 Using environmentally friendly materials in custom built homes is something that has been popular for several years now and is still one of the most popular design trends for custom homes. Environmentally friendly flooring, such as engineered hardwoods, can give you the beautiful look you in your want home while lowering your carbon footprint. If you’re interested in learning more about environmentally friendly materials and reclaimed materials for your custom built home talk to the experts at Don Mills, one of the top custom home builders in Greensboro, today. The best source for finding reliable and talented custom homebuilders is other homeowners. Ask your family and friends for recommendations and ask them to ask their friends who have had custom homes built if they are happy with their homes. You can also look online in Facebook groups and on design blogs to find recommendations. Consider joining home improvement and service groups like Angie’s List or Home Advisor because they are trusted and reliable sources of recommendations for all types of home improvement services and custom home builders. Once you have built a list of several home builders that have been highly recommended, the best thing for you to do is to make an appointment to sit down with a customer service representative from each one of those building companies. A team member should be willing to spend time answering your questions, showing you a home model, and talking about all the available options for your home. But most of all, that representative should listen to you when you describe your dream home. If you feel that the service rep isn’t listening to you or isn’t communicating effectively, then that builder is not the one for you. Communication is critically important throughout the process of building a custom home, so only work with a home builder that will listen to you and work with you to create your dream home. Are there previous customers that you can speak with about their home and the building experience? If the builder is unable to give you references, cross that builder off your list immediately. How much of the home will be custom designed? What are the restrictions and fees set by the HOA in the community? What is covered by a warranty? You can add other questions to the list too. Bring a notebook with you when you meet with the builder and write down the answers to these questions so you will remember the answers later. 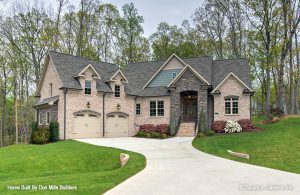 If you’re in the process of choosing a custom homebuilder in Greensboro, be sure to include Don Mills Builders, a team with years of experience, a solid reputation in the community, and an eye for the finest details in custom homes.